There are as many reasons as there are snowbirds as to why retirees head to warmer territory than their home state during the winter months. It’s not news to anyone who knows me that one of my top reasons is that I can be outside and enjoy nature. The weather here is like everywhere else – up and down. But, we have had some beautiful, sunny, warm days in the mid 70’s. Those days are true gifts from Mother Nature. They allow walks on the beach, at the gardens, or just around a shopping area to enjoy hanging baskets and planters done up for spring. Yes, spring has sprung in South Carolina. Magnolia tree, hyacinths, tulips, and daffodils. Besides the beautiful spring blooming flowers, there are also animals to enjoy. 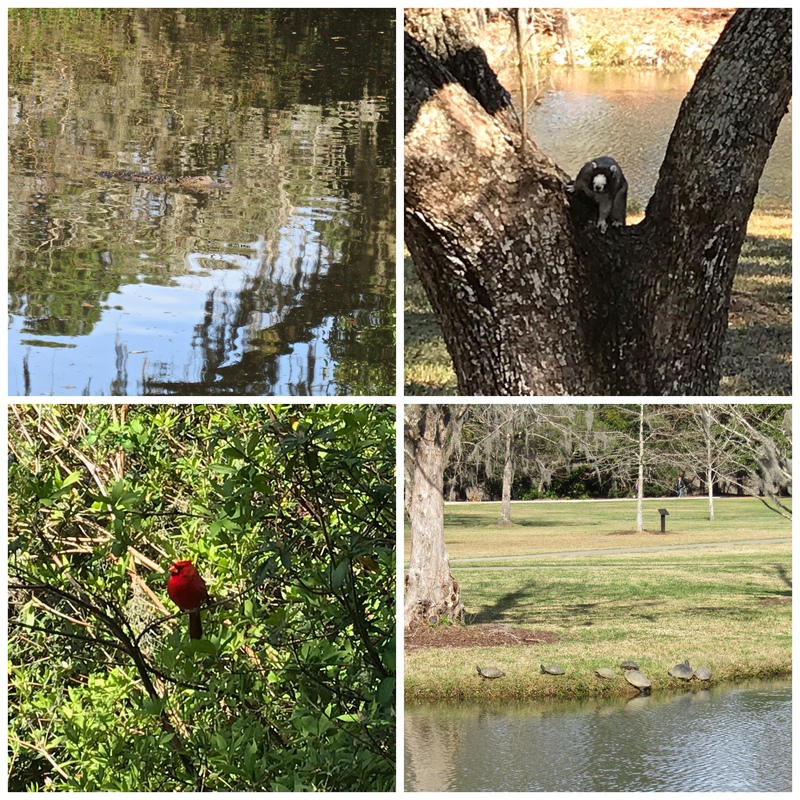 Gator swimming in the tree reflections, fox squirrel, cardinal, and turtles. We stay in touch with the weather at home because although we’re thrilled we don’t have to scrape and shovel, we know our daughter is clearing paths and driveways. 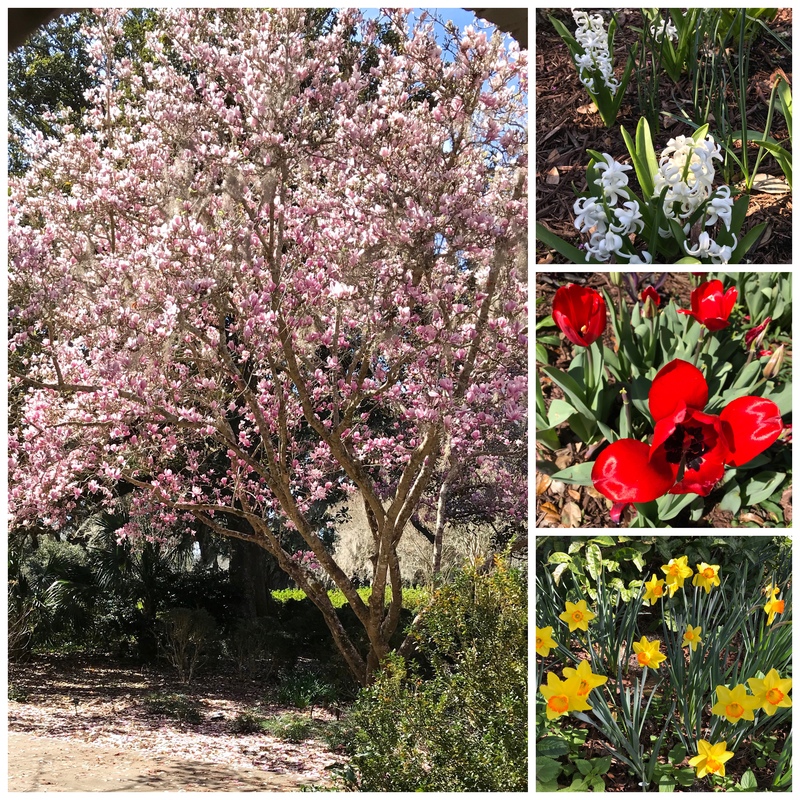 This entry was posted in South Carolina, Traveling and tagged Brookgreen Gardens, Gardening, Murrells Inlet, Retirees, Snowbirds, South Carolina, Spring chores, Winter, Yard work. Bookmark the permalink. They certainly are! Which reminds me … I need to buy flowers today. Some balm for the soul would be nice! When we were in the south last week, one of the best parts was seeing the flowers blooming! And the green–we’ve gone a long time without green up here . . . It’ll still be pretty cold when you get home, won’t it? You may even get a chance to shovel a little snow, for old times’ sake . . . .
Oh, thank you! It is so bleak here that your photos are all the more miraculous. I needed the reminder that winter really isn’t eternal. I particularly love those hyacinths (I’m not sure but I think I can smell them from here). Your collages are kind of like quilts, yes –where each part does its own thing yet they all work together? It’s a lovely effect! Believe it! When I spot that first daffodil, they’ll hear me on Mars! Oh Judy, I’m glad you have the opportunity to be surrounded by first spring. It looks lovely. Enjoy the warm weather and perhaps when you get back , the snow will be gone and the air will smell like a new season. Good to see the magnolia flowering…looking forward to our turn. I was just about to ask what the little creature in the tree was when I saw that Joyce had correctly identified it as a fox squirrel. Never heard of a fox squirrel and what a treat to see one even if it’s only in a photo. Learned something new today. What a great way to start the day! Not today, but yesterday. A little storm blew in with a few inches of snow. I’ve heard rumors of spring spreading to N.C. too. We have potential to hit 60 degrees today in Southern Delaware, and I’ll take anything at this point above 40. We are still below freezing some nights this week. My daffodils are poking their leaves up through the garden leaves. I am just wishing for some sunshine. Tired of the gloom. Enjoy your last weeks along the beach and thanks for reminding us that winter is soon over! Love to see the signs of spring where you are. The trees and some wildflowers were flowering in north central Florida and the azaleas are almost in full bloom here in coastal Georgia. Won’t be long before the dogwoods are in full bloom. Of course I will! They’re my favorite. I love pink dogwoods but they are not very common. I don’t have any desire to spend significant time away form this weather up here, but I am a bit jealous of being able to walk and see the beautiful sights you have shared. I hope the rest of your time in SC is as remarkable as these photos, Judy. I’ll try to clear the road in Hartford so you have an easy ride through. I always appreciate when you clear me a path through Hartford. 🙂 We’re leaving a couple of days early so we can travel on the weekend hoping there will be less truck traffic at least. Check your plans against NCAA basketball tournament. Hartford is hosting first round games. Oh my – thank you for the warning. We’ll definitely check. So nice to see these gorgeous flowers and the magnolia tree in full bloom. I like the shots you took of the turtles and the cardinal. That fox squirrel is quite unique, but it looks a bit intimidating to me. Maybe he’s just camera shy! What a pleasure it is to see nature blooming and critters basking in the warmth of the sun. I am so tired of freezing temperatures and ice and snow and sleet and ice and freezing rain and ice and endless slush and now mud, and did I mention ice? Lol. What beautiful and interesting photos! Encouraging, too! I am quite ready for more colors around here than white, brown and asphalt! That fox squirrel is neat. I ’ve never seen one. Two Springs for a gardener like you must be heaven. 2 springs is a luxury. Lucky you. Such beautiful photos of now… and I’m hoping then. Safe travels. It’s the same here. Many retirees head north from the southern states to warmer temperatures in winter. They hitch up their caravans and go wandering for three or four months. They’re fondly known as “grey nomads”. Enjoy your beautiful spring weather. Wow, beautiful! Spring is springing! What is that scary animal in the tree?!?! It resembles neither a fox nor a squirrel. It looks like a small panda or a wallaby. I mus be looking at it wrong. Regardless, I would not mess with it. I never thought I would be one that would be a snowbird, if given the chance, but I think I probably would if I could. But even if we could, I don’t think Roger could survive the trips. But I sure enjoyed seeing these photos of what will eventually be here! I never understood why folks went to warmer climates until I did it the first year. Then I appreciated being able to walk outside in weather that resembled spring/fall temps. Yes, the traveling is not the fun part of it, we do miss family ,but enjoy our time with winter friends. We’ve just returned from a short trip to South Carolina; the Lowcountry is one of my favorite parts of the world. It has been spring here at home for some weeks now, as we live in the South. My in-laws (based in NH) used to spend several weeks each winter on the South Carolina shore, and then enjoy a slow trip by car back home with the changing season. There’s actually a book called “North With the Spring” by naturalist Edwin Way Teale, describing his and his wife’s own journey following the season in the US. It’s well worth seeking out! Spring and nature and rebirth… all go hand in hand. We are starting to see Spring here in the desert… although a bit late in some areas because of our colder then usual winter. The wildflowers are in full bloom! Enjoy the rest of your time in the south…! You brought up a timely issue. The pollen right now is absolutely covering everything with yellow. The pollen count is 10.4/high today from Juniper, Elm, and Oak. First day I’ve kicked on the AC. Well…. I’m warming things up for your return trip home to New Hampshire. Today was 61° and I actually sat outdoors on the deck in the sun. Snow is melting fast and running downhill in rivers of water. I hope the snow vanishes soon and these mild temperatures greet you upon your return. Two springs is a great treat. I just got back from two weeks in CA and it was lovely to see things blooming. Things are warming up here and our own spring won’t be long now. Hopefully, your return will be timed perfectly! What a glorious spring! Well, at least here we have the first Snowdrops.